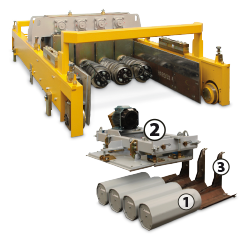 The new generation of EVO series extrusion machines represents the state of the art in the production of prestressed hollow core slabs. Available in 5 versions depending on the type of elements to be produced, the NORDIMPIANTI extruder offers cost-effective solutions for companies who are looking for a flexible approach to produce hollow core slabs in various sizes. The extruder machine casts elements in a single phase using the extrusion method without the need for vibration thus keeping the noise of the machine to a minimum. 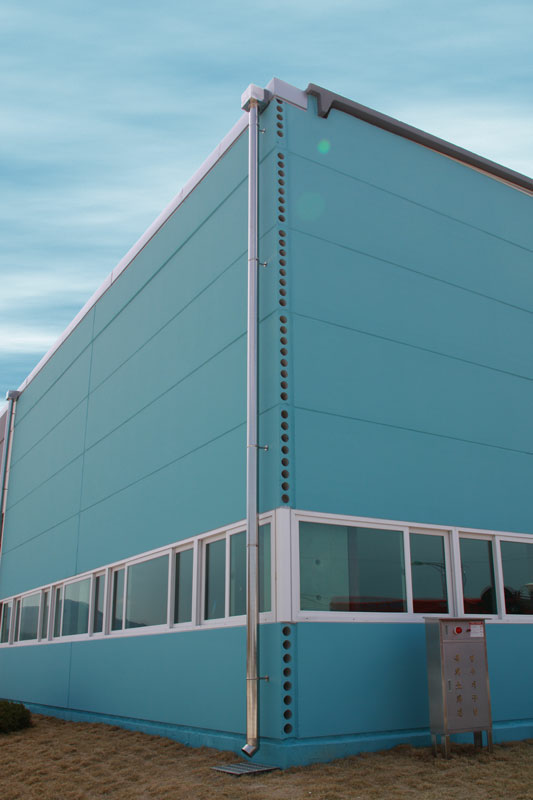 The machine is modular and the power unit together with the hopper can easily be transferred to another forming insert to enable a panel with a different height to be produced. The best extruder machine available for the production of hollow core slabs. Concrete is delivered to the extruder's hopper (1) and falls by gravity onto the Archimedean screws (2). The screws then drive the concrete into the compaction chamber (3) where the forming tubes (4) are situated. The forming tubes and the side formers create the shape and the voids of the element without the use of vibration. Screws, together with the forming tubes, the side formers and the smoothing device (5) have an oscillating movement backwards and forwards which give excellent concrete compaction at every point along the element ensuring the element’s excellent technical characteristics. 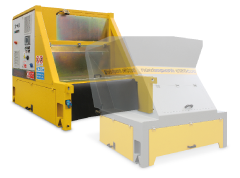 NORDIMPIANTI’s evo extruder is equipped with a compaction control system (6) that allows the operator complete control of the machine in order to reduce or increase the concrete compaction when required. Screws, together with the forming tubes, the side formers and the smoothing device (5) have an oscillating movement backwards and forwards which give excellent concrete compaction at every point along the element ensuring the element’s excellent technical characteristics. 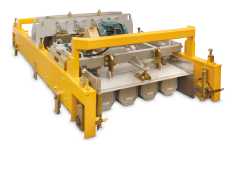 NORDIMPIANTI’s evo extruder is equipped with a compaction control system (6) that allows the operator complete control of the machine in order to reduce or increase the concrete compaction when required. The EVO NORDIMPIANTI extruder machine is made up of 3 main units, a universal control and power unit, a universal hopper and an interchangeable forming insert module. 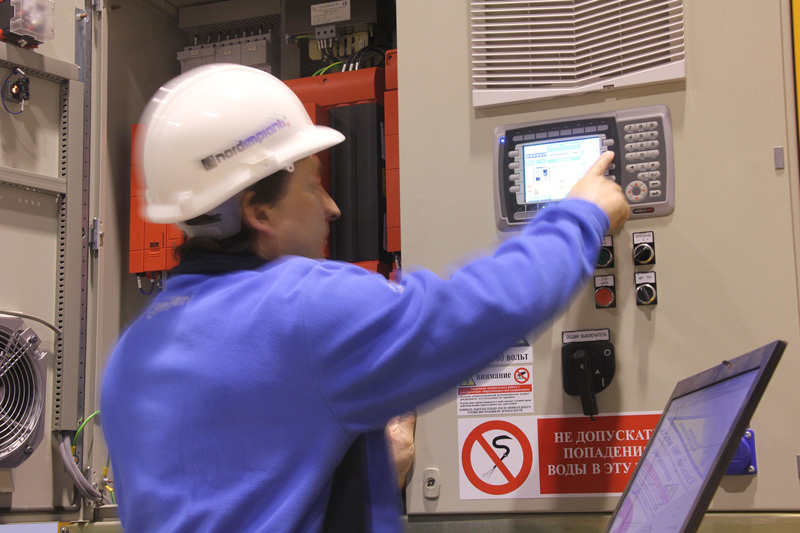 The universal power unit houses the main motors, the drive motors and the control panel. 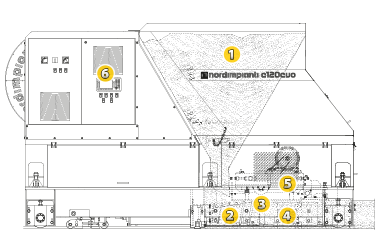 The power unit, together with the hopper can be easily and quickly transferred to another forming insert to produce a different element. 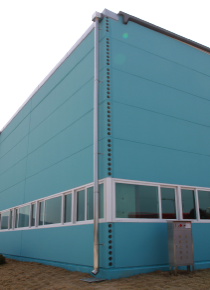 Screws, together with the forming tubes, the side formers and the smoothing device (5) have an oscillating movement backwards and forwards which give excellent concrete compaction at every point along the element ensuring the element's excellent technical characteristics. 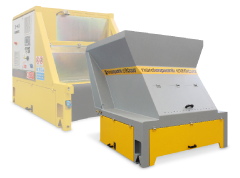 NORDIMPIANTI’s evo extruder is equipped with a compaction control system (6) that allows the operator complete control of the machine in order to reduce or increase the concrete compaction when required. The concrete is delivered to the machine’s hopper. The concrete then falls onto the Archimedean screws of the forming insert. The hopper has a minimum level sensor which stops the machine if there is not enough concrete. 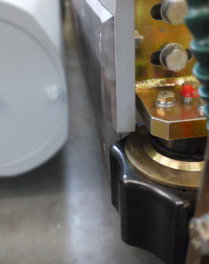 This device stops the machine in order to avoid the situation where element damage can occur if the machine is completely out of concrete. When the hopper is refilled the extruder automatically restarts. The forming insert contains the special gearbox with an oil bath for the transmission components. It also contains the Archimedean screws, forming tubes, side formers, smoother device and the wire guides. 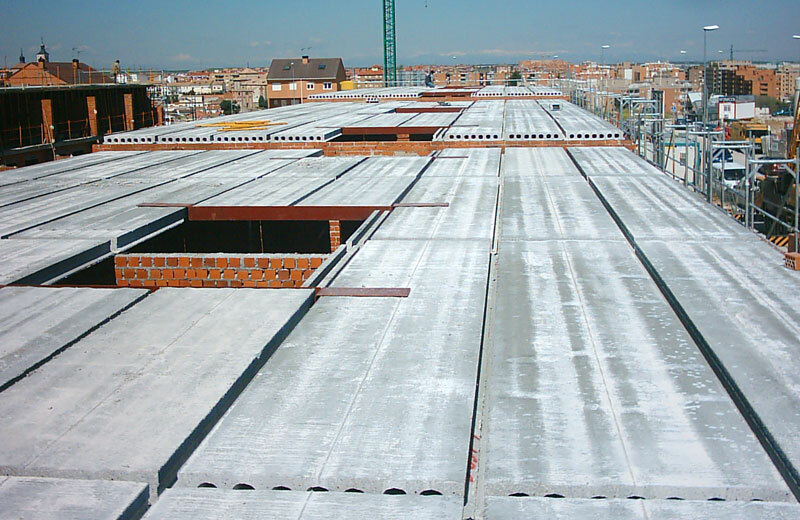 The height of the hollow core slabs and the number of voids is determined by the forming insert. 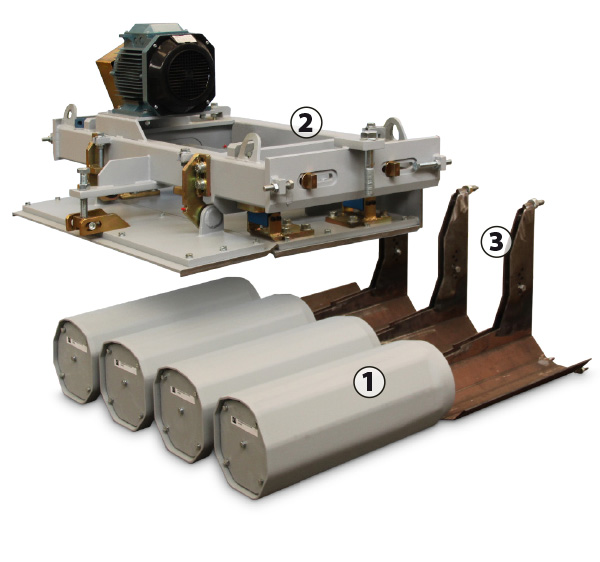 Different element heights can be manufactured by changing the forming inserts. 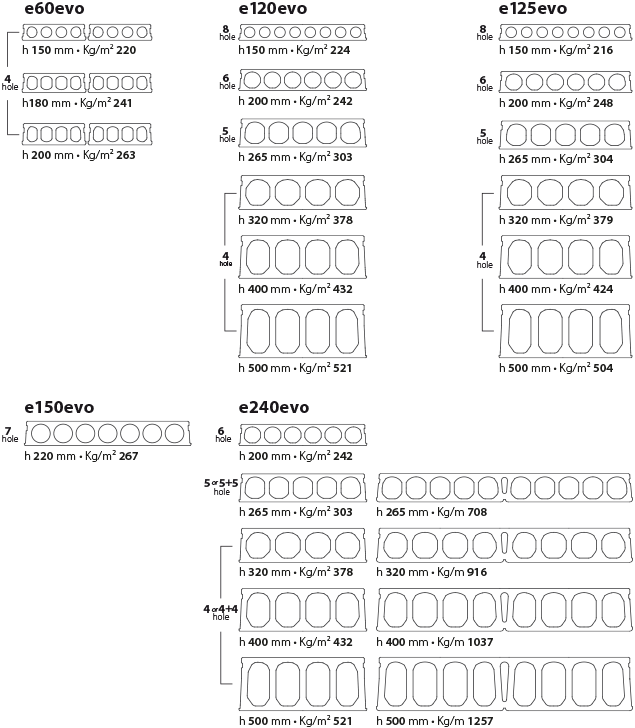 The standard forming inserts produce hollow core slabs with 8, 6, 5 or 4 holes. For the 4 screw forming insert the accessory sets can be supplied to enable panels between 320 mm and 500 mm high to be produced. Special accessory sets are also available for other forming insert types. 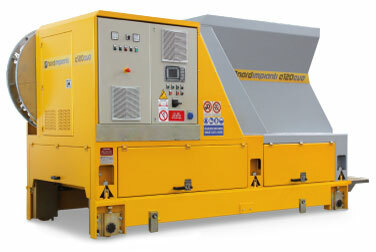 Extruder evo machines can be supplied to produce slabs with widths 2 x 600 mm, 1200mm, 1250 mm, 1500 mm, 2 x 1200 mm or 2400 mm. With the NORDIMPIANTI Extruder evo machine it is possible to produce hollow core slabs for floors and for walls. The production system gives a good surface finish on both sides of the element (one side is smooth because of the steel casting bed and the other side is given an excellent finish by the smoother device on the casting machine). It means that the panel is finished, ready for painting if required. NORDIMPIANTI’s evo Extruder can also be equipped to produce hollow core slabs for floors with profile edge keys along the sides of the element. These enable the elements, when constructed together to meet seismic requirements. The particular corrugated side edge is made by special edge cog rollers.